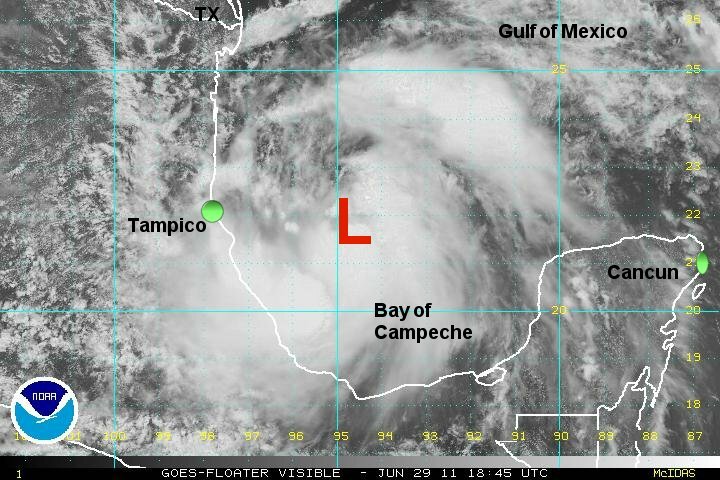 A very disorganized cluster of showers and storms is over the Bay of Campeche and southwestern Gulf of Mexico. Arlene was classified due to a Dvorak classification from NHC's sat department. We aren't quite as bullish and think that it is actually just below tropical storm strength. As of 7 pm cdt Arlene was centered at 21.2 N / 93.7 W or about 280 miles ese of Tampico, Mexico. It was moving wnw at about 7 mph. Top sustained winds estimated at 35 mph ( 40 mph NHC advisory). Pressure was estimated at 1003 mb. Forecast models have been persistent in taking this storm into Mexico well south of the Texas border by the next 36 hours. A very apparent increase of showers and storms occured last night with Arlene. It was interesting to note that NHC didn't increase their wind estimate from last night. That is why we thought that they we a little early in classifying this as a storm. With the gained convection, we now believe that this is a storm. 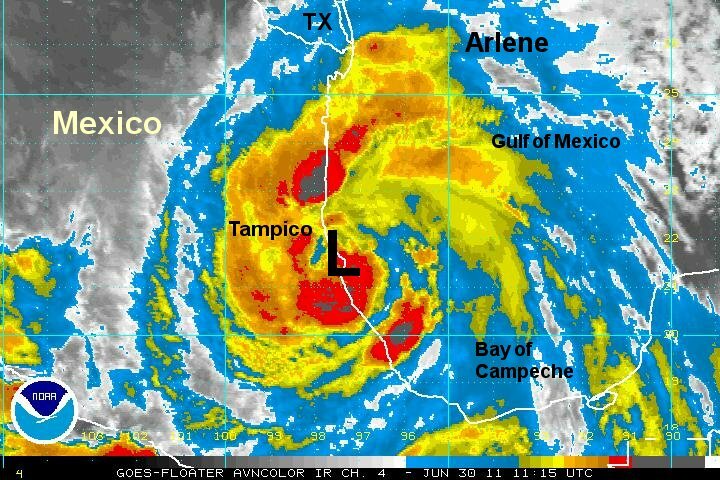 As of 7 am cdt Arlene was centered at 21.8 N / 95.2 W or about 175 miles east of Tampico, Mexico. It was moving wnw at about 8 mph. Top sustained winds estimated at 45 mph ( 40 mph NHC advisory). Pressure was estimated at 1002 mb. Forecast models have been persistent in taking this storm into Mexico well south of the Texas border laste tonight. Arlene has slowly gianed strength today and will make landfall late tonight near Tampico Mexico as a strong tropical storm. The main effects will be heavy rain and gusty winds with some storm surge near and north of the landfall point. 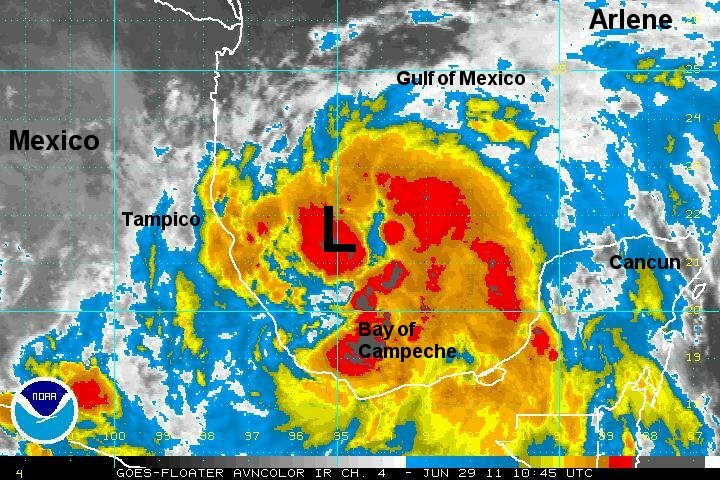 As of 4 pm cdt Arlene was centered at 21.1 N / 96.1 W or about 140 miles east southeast of Tampico, Mexico. It was moving west at about 7 mph. Top sustained winds estimated at 50 mph ( 50 mph NHC advisory). Pressure was estimated at 1000 mb. Forecast models have been persistent in taking this storm into Mexico well south of the Texas border late tonight. Arlene made landfall landfall shortly ago near Cabo Rojo or a little over 50 mils south of Tampico, Mexico. As expected it made landfall as a strong tropical storm. It would have become a hurricane if it remained offshore another 12-24 hours. It will now weaken rapidly as it is over land and the main threat will be flash flooding from heavy rainfall. 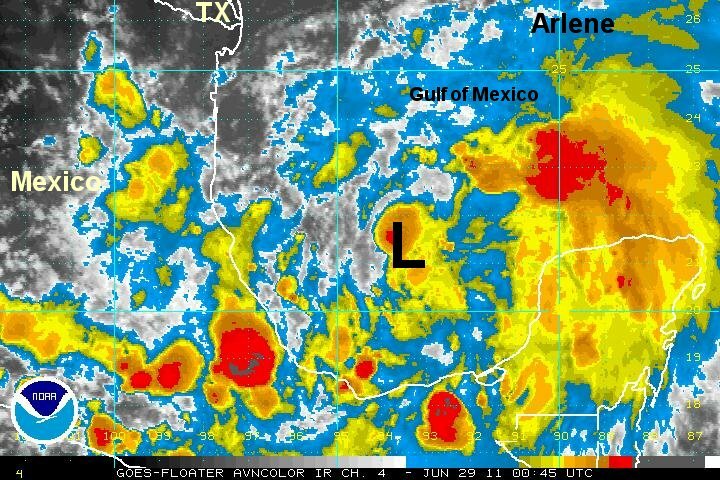 As of 7 am cdt Arlene was centered at 21.6 N / 97.5 W or about 55 miles south southeast southeast of Tampico, Mexico. It was moving west at about 8 mph. Top sustained winds estimated at 65 mph ( 65 mph NHC advisory). Pressure was estimated at 993 mb.